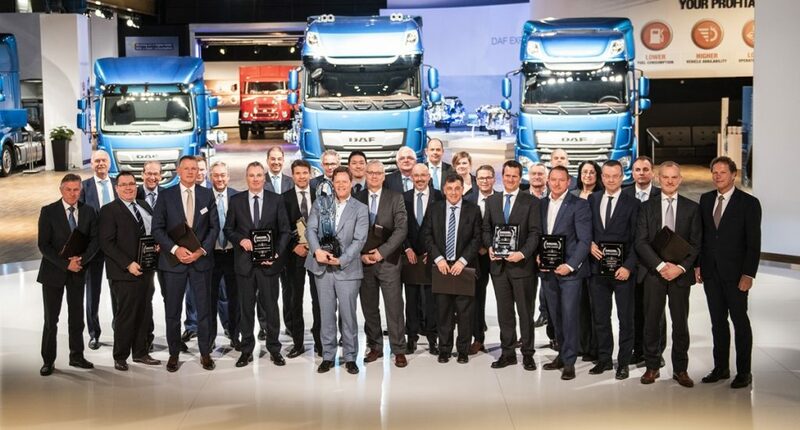 DAF Trucks N.V. has honoured its best performing suppliers of 2018. At an event at the DAF Eindhoven headquarters, Berco Truck Components from Schijndel in the Netherlands received the title Master in the Supplier Performance Management (SPM) program for their outstanding performance in the areas of product development, operations support and business alignments. The award was handed out by Jos Smetsers, Executive Director PACCAR Purchasing Europe and member of the Board of Management DAF Trucks N.V.
DAF recognizes its top performing suppliers in its SPM program that started in 2018. Honour is given to suppliers that can reach the SPM status of Achiever, Leader and Master. The SPM program evaluates a supplier’s performance in the areas of product development, operations support and business alignment with DAF objectives. Through the program, suppliers and PACCAR cross-functional teams collaborate to identify performance enhancements and to develop product innovations. ZF Friedrichshafen AG, Alro Group, Contitech Fluid Serbia, Nedschroef, Theuws Groep and Voss Automotive GmbH were titled 2018 SPM ‘Leaders’. The SPM ‘Achievers’ of 2018 are DAF suppliers Goodyear, KS Kolbenschmidt, Fiberpachs SA, Voestalpine Sadef NV, Doesburg Components, Eaton Automotive Systems, Leoni, Grammer, Pierburg, Borgers Sud, ThyssenKrupp Forged Technologies, Wabco Vertriebs and Continental Automotive.